And it was super memorable for me. Not only did I get to see the NBA players from the tube, I got to see MY NBA team, the Indiana Pacers. I must have been smiling the entire time I was there because I felt my cheeks hurt after the event. The event was the official introduction of the teams that are going to play on Oct 10 (today by the time this goes up). I was super happy when I got the call that my friend had extra tickets to this event. It was a no brainer to reschedule all my evening meetings to another day. I got to Sofitel early and waited at the hotel lobby instead of by the tent entrance since it was colder there and I had to wear business formal attire. So much to my surprise, players suddenly were passing through the lobby going to the event. I saw players Ian Mahinmi, George Hill, Chris Copeland pass on separate occasions and I just froze up when I saw them. It wasn’t until I saw Danny Granger that I approached him to say hi. Got rejected to take a photo since he was in a hurry… but it was awesome. David West also passed by a little later on. 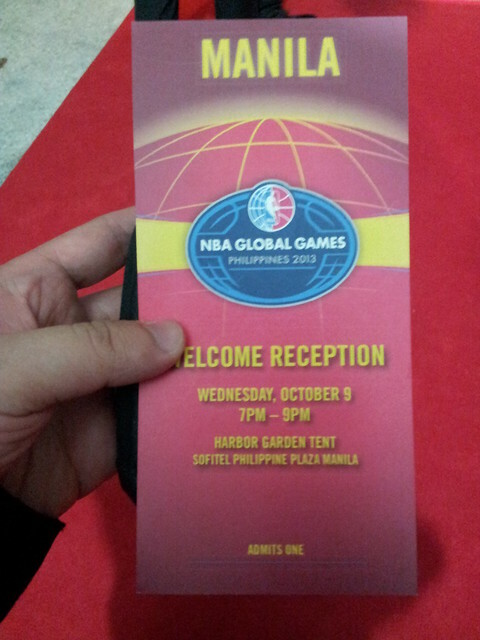 The other folks who were in the lobby I could tell were only there because they knew Jeremy Lin and no one else. Each time an African American passed by either a guest or member of the training staff, they would whisper, “is that a player”. Lin eventually arrived and was barraged with photographs. 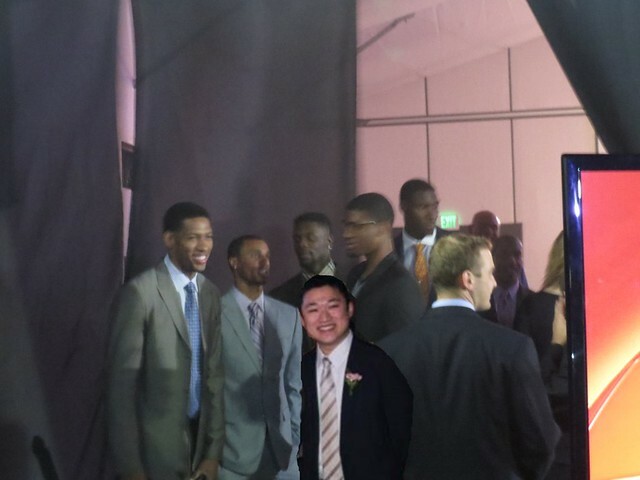 My friends arrived also and I went inside the tent where I had my pictures taken with Clyde Drexler, Ron Harper, Robert Horry and best of all, former Pacer, JALEN ROSE. 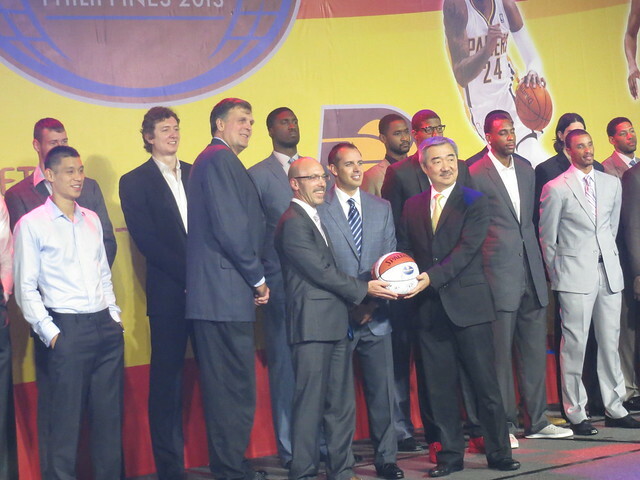 Then the main event, the players came out. I was super stoked to look at the players and was secretly hoping that there was a contest to name everyone on the team. 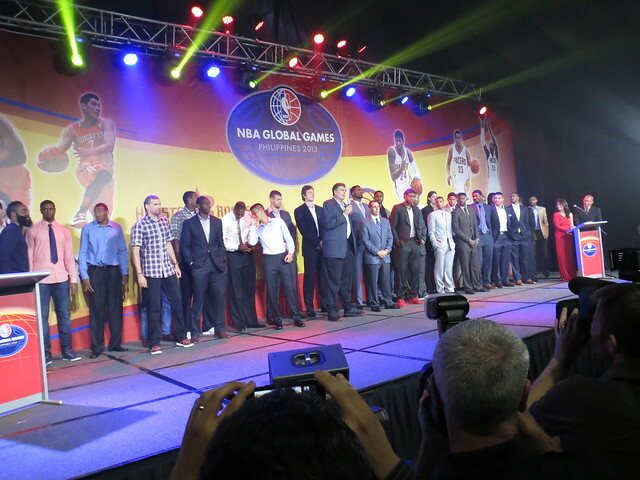 Hans Sy from SM took the stage to welcome the NBA and then Lin and George were also given the chance to say some words about the Filipino fans. 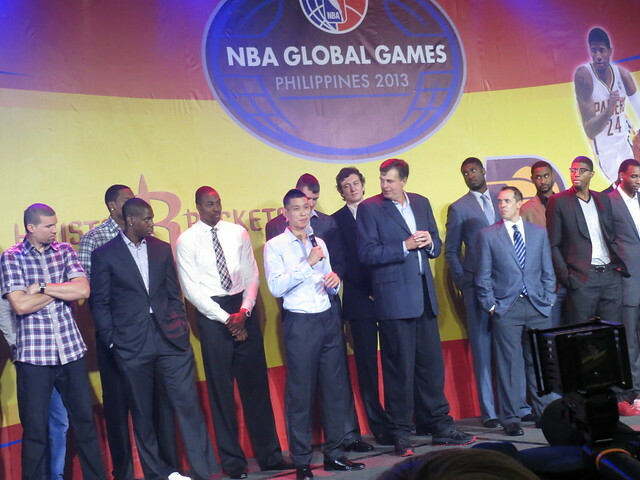 Both coaches, Mchale and Vogel also said a few words about being happy to be here. Best part of the night was when this picture was taken. Fortunately or unfortunately it was all in my mind. But it was awesome anyway. 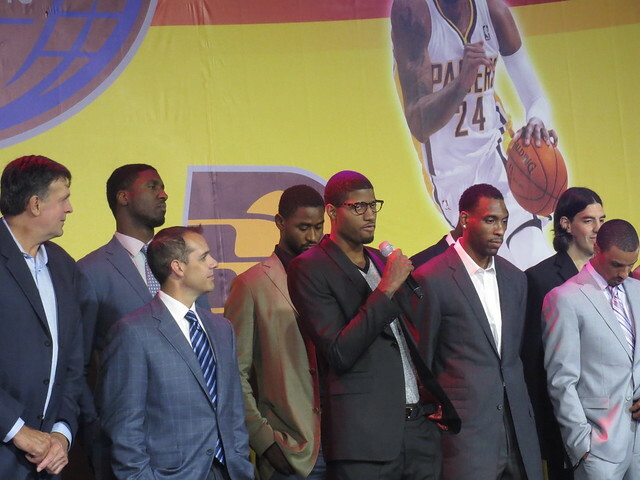 The Pacers mean business this year and are set to win it all. I could tell by the body language and the way they present themselves. Just compare how they’re dressed and standing vs the Rockets. Prediction for today’s game, Pacers get the W.